The Tipsy Baker: The pitmistress? Where did the last week go? Have I been busy? I sure hope that's it. On Memorial Day I made Texas barbecued brisket. Here's Steven Raichlen, author of The Barbecue Bible, on the subject of brisket: "Pit masters spend years learning the right combination of smoke (lots), heat (low), and time (measured in half days rather than hours) to transform one of the toughest, most ornery parts of the steer into tender, meaty perfection." As my father used to say, Whoa there big horse. Raichlen makes barbecued brisket sound like an epic feat requiring years of study and the brawn of a bull rider. Yet somehow on the very first try I wrestled the toughest, most ornery part of a steer into tender meaty perfection. You could do it too. It wasn't hard. Making tuiles? That's hard. I hesitated to mention how easy this brisket really was, as barbecue has a mystique that many of us cherish. We like the idea that the best tasting barbecue can only be made by an old redneck with a drawl and cheekful of chewing tobacco. An elderly black man also works. A woman? No. Women should be off in some kitchen baking pie or something. It's sexist, but as sexism goes, benign. There's little enough romance in the world and maybe I'm just making it worse by demystifying barbecue, so I won't. I'm SURE old men in Texas make far better brisket. But the brisket I made was still really good. Here are the basics: Start with an 8 pound brisket and the night before you cook, rub the meat with seasonings: chili powder, cumin, black pepper, coarse salt, sugar. Refrigerate. In the morning, as early as you can get up, start the barbecue (a few smoldering coals, a chunk of soaked mesquite) and place your brisket on the grill. Cover and stick a long-stemed thermometer in the vent and try to keep the temperature between 180 degrees and 220 degrees F until dinner time, replenishing coals and mesquite as necessary. You'll need to check every 30 minutes or so. As Chris Schlesinger and John Willoughby write in Thrill of the Grill: "Obviously the key here is a tremendous amount of patience and a day when you want to do nothing but sit around. . . Put the top on the cooker, pull up a chair and grab the cooler." There we ago again with the manspeak. Women just don't grab coolers. We have other vices. A friend asked if I'm becoming an exhibitionist. Answer: Anyone who keeps a blog like this is already an exhibitionist. Anyway, you slice the brisket against the grain and serve with barbecue sauce and whatever else you like. In the picture the brisket looks burnt, but it's not. The spices and sugar caramelized to form a dark crust. You could see the succulent meat through the cracks if you got close up. -I tried an excellent recipe for coffee-laced barbecue sauce from Smokestack Lightning that included ketchup, hot sauce, Worcestershire, vinegar, brown sugar, and instant coffee. Smokestack Lightning is a fun book and if you're ever planning to travel around the South visiting barbecue restaurants, you should track it down. -Ginny Lee alerted me to a fantastic cole slaw recipe. I've been making the same mayonnaise cole slaw for 15 years, but this is what some people would call my new "go to." I do think the dressing can handle more cabbage, so I wouldn't stop at 1 1/2 pounds. - For the second time in a month I cooked the baked beans from Make the Bread, Buy the Butter and for the second time in a month thought they were too spicy when I first tasted them and then perfect a few days later. What's going on with that? I used pinto beans and now prefer them to navy beans. Bigger, softer, more velvety. I also call for an apple in the recipe, but omitted it because we didn't have one and nothing was lost. In future, no apple. Recipes can always be streamlined, augmented, and clarified and these are changes I would make in the book if I could. - For dessert: rhubarb pie from Nancie McDermott's indispensable Southern Pies. With two small adjustments this should be the perfect rhubarb pie recipe and I will post when confirmed. That is all. It was a lovely party and I'm sorry it took me almost a week to post about it. We had so many leftovers I didn't cook a single meal last week. Tonight, though, I'm going to have to cook. I love that you let those old pit masters keep their dignity. However, I agree that BBQ is not nearly as complicated as many make it out to be! I love to work the grill and the smoker although I have to say it's nice to have one culinary task (besides pancakes) my husband's alway willing to take over. I haven't tried brisket yet so I look forward to trying out your version. That coleslaw recipe is intriguing. I've made coleslaw three times in the past two weeks for whatever reason, from a much fussier Epicurious recipe. Also, it has horseradish in it. I like the little bit of zip, but it's kind of contrary to the purpose of coleslaw, right? I also wanted you to know that I'm finally going to make my own yogurt from your recipe. I'm spending way too high a percentage of my grocery bill on Greek yogurt these days. You'll love the yogurt recipe! It's so easy and gives you an incredible feeling of pride! I do a double strain, making it so thick, it's wonderful for smoothies-and sooo inexpensive! Jennifer, I don't doubt for a minute that you can anything you set your mind to do, but my grandfather barbecued whole hogs in an actual pit, and I have to say that is entirely different matter. Can you imagine trying to cook a piece of meat that big with that much rendered fat while not over/under cooking and not setting the pit on fire? In the South, pit masters are those that cook the entire animal, not just a cut. Also, beef? What? You would be drummed out of town for barbecuing beef instead of pork in most towns in the South. 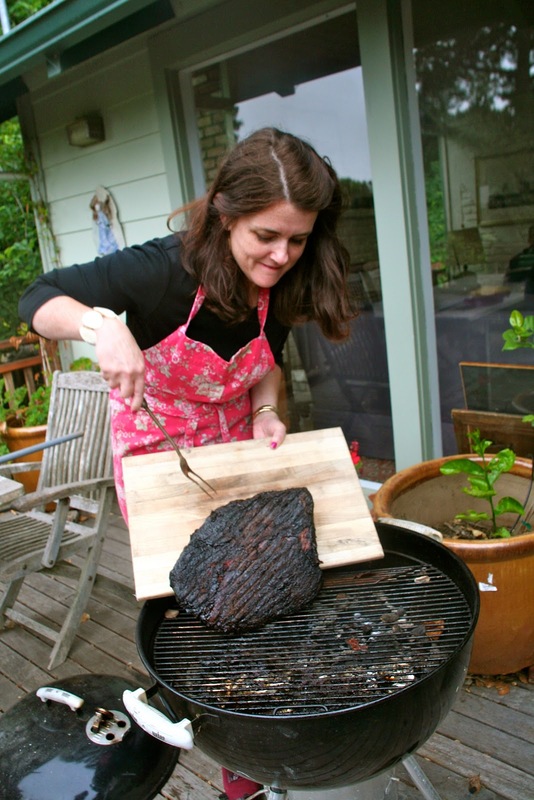 Your brisket looks delicious, and I bet your party was a lot of fun. Not in Texas! Beef rules in Texas, and my dad still waxes rhapsodic about the barbecued brisket he used to eat in Houston. Oh, yes, Kristin, I had that in my comment, and it got lost somehow. Texas is all about the beef, and it's understandable since you have such great beef. But in other states in the South, pork rules! Beckster -- Of course you are right! Doing a whole animal in a pit is indeed a very different proposition and I was overly flippant. I could never do that. Jennifer, I don't think you were flippant, I was just jerking your chain. And I know you could do a whole animal in a pit if you wanted to do it. Look at all the things you have done! Things I would never attempt, pitmistress. One trick I usually use when barbecuing is to smoke the meat the day before for as many hours as I can, then plop the whole thing into my Crock Pot overnight on low, to finish getting the meat tender. It is unorthodox, but it works really well. The meat gets really tender, but still has through-and-through smoke flavor, and a deep red smoke ring crusted with black, just like in your picture! But it seems yours came out tender anyway, so what do I know. I can't think of anything better than a fridge full of barbecue leftovers...they really take the edge off the rush-home-from-work-to-cook-something-for-dinner problem. And tasty! I've been reading Bee Wilson's book Consider the Fork and just finished the chapter on roasting and the skillset involved. Apparently there's a man in England named Ivan Day who specializes in cooking as close as possible to how it would have been done before the invention of the stove. Your brisket looks amazing. The coleslaw I find somewhat terrifying, I have to confess.